The University of New Mexico Athletic Department can barely afford to keep the lights on. Actually, it can’t nearly afford to keep the lights on. According to figures obtained by NMFishbowl.com, half the yearly utility costs for UNM’s athletic facilities are paid for by the school’s Physical Plant Department — an extraordinary defrayment that is not acknowledged in Athletics’ stated budget of $34 million. In recent years, this implicit arrangement has meant that over a half-million dollars of annual utility expenses are kept off the Lobos’ books. It also calls into question what the actual deficit of the perennially delinquent athletic department would be if it were made to pay for all its expenses. Sources say that none of the other UNM auxiliary units are similarly subsidized by PPD and, according to a national expert, the 50-50 split is very unusual for an athletics department at a public university. “The norm is for athletics to be at 100 percent” self-sufficiency, said Lander Medlin, executive vice president of the Association of Physical Plant Administrators. While public universities often find reason to make some small utilities subsidizations (e.g., for commencement ceremonies held in the school’s basketball arena), Medlin doubts anyone could make a fair-minded case that university sports facilities are used for non-athletic purposes half of the time. Glen Haubold, New Mexico State University’s Associate Vice President for Facilities and Services, says that NMSU’s main campus picks up the tab for some athletic utility costs, but nowhere near 50 percent. UNM’s utilities off-set is part of the $10 million disparity between what the Athletic Department publicizes as its annual budget, and what it reveals in the annual “Agreed-Upon Procedures Report” it provides to the NCAA. NMFishbowl.com previously obtained this report from 2016, which did reflect the $555,302 paid by main campus for athletics’ utilities. That accounting, however, showed UNM’s athletic department revenues last year were $43.1 million. According to the document, the UNM Athletic Department receives $6.3 million in institutional support, in addition to $4 million in student fees. However, department officials have repeatedly argued that they need more assistance from the university. Last year, former Athletic Director Paul Krebs requested an additional $500,000 from student fees, a 12.5 percent increase. In his appeal to the UNM Student Fee Review Board, Krebs claimed that UNM athletics is “75-percent self-funded,” the most among Mountain West Conference member institutions. But the issue here goes beyond mathematical transparency. In recent years, PPD, with its $67 million annual budget, has had to cut scores of staff positions; outsource loads of repair work to expensive contractors; and bear an escalating backlog of preventative maintenance work orders. This raft of recent cost-cutting maneuvers will invariably lead to greater long-term infrastructure costs, experts say. Lander said that over the last three decades, there has been a national trend in higher education to compel auxiliary units at public univerities to stand on their own two financial feet. “Athletics was really the last one to be brought on board,” Lander said. Wanita Kirkman, UNM’s former associate director for PPD’s Finance & Services, said that in the mid-1990s, the university began a process of gradually shifting the south campus’ utility costs to the Athletic Department, with the idea that athletics would eventually assume full responsibility. But that never happened. “There was an effort to get them to pay what they should be paying and that got so far and then it topped at the 50-50 mark,” Kirkman told NMFishbowl.com. Several UNM sources have specifically fingered David Harris, the school’s executive vice president, for continually keeping athletics off the hook for its utility costs, to the detriment of the greater campus. “It was hurting our budget and we would bring it up every year, and it never changed,” Kirkman said. Neither Harris nor a UNM spokesperson responded this week to questions and requests to comment for this story. Sources say that this has long been a sore subject among facility administrators at the school. And the contention has become only more acute since the 2008 financial crisis. In the wake of the economic downturn, the state of New Mexico froze the annual instruction and general support (I&G) monies provided to UNM. Those funds are what is used by PPD to pay utility costs, including for athletics. As the campus infrastructure has continued to grow, PPD has been forced to do more with the same. 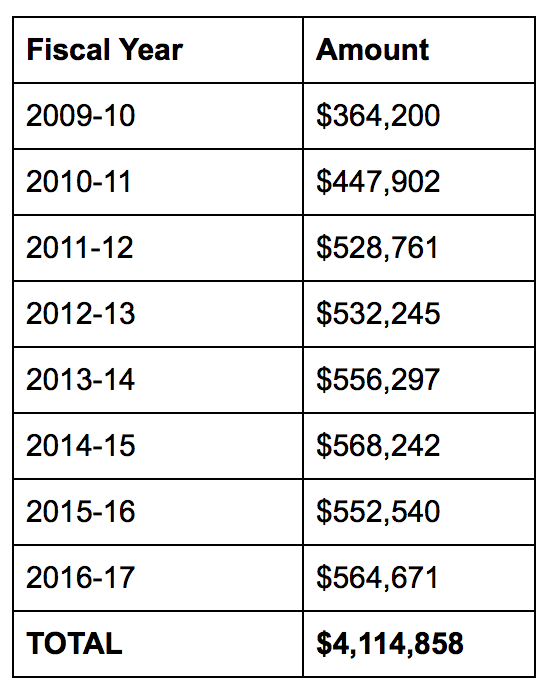 Memo shows State Auditor dramatically increased its special audit budget after digging into UNM athletics. The inquiry into the Lobo coach continues to expand. Why did it take so long to start?